Download the registration form to become a part of the Pathway To College program. 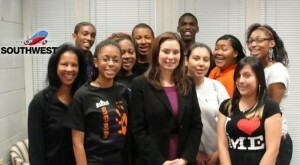 US Treasurer Rosie Rios and EOYDC ‘s finest! We offer weekly informational workshops on preparing for college, time management, decision-making and positive choices. We also encourage students to demonstrate positive character attributes, through youth leadership. Our Brotherhood & Sisterhood Across America is the youth led college mentoring model where EOYDC’s alumni, undergraduate and graduate students in dozens of states, in a wide variety of fields, including business, law, social sciences, and the arts mentor younger high school or college students. Nearly 20% of students attend Historically Black Colleges, such as Morehouse and Clark Atlanta. Other EOYDC alumni are students at UC Berkeley, Harvard University, New York University, Georgetown University, Northwestern University, University of Michigan, among many other institutions. Something For Everyone, is our annual fundraising event which not only provides us with essential funding to grow the list of college bound applicants, it solidifies the brotherhood and sisterhood network. We want to extend a special “thank you” to EOYDC Board Member Ellen Wakeley, Esq. and Soroptimist International of the East Bay for volunteering their time along with the initial and continued funding that implemented this wonderful program. Over the years, this special fundraiser allows us the opportunity to celebrate and award over $400,000 in scholarship and foundation support to our college bound students. 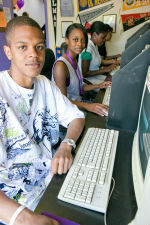 Recently, PTC2 was instrumental in the launch of The East Bay College Access Network (East Bay CAN) – is a collaborative established in November 2011. The mission of the East Bay CAN is to increase college-going and persistence rates in Oakland. Founding members include The East Bay Consortium of Educational Institutions, Inc., East Oakland Youth Development Center (EOYDC), Centro Legal De La Raza and the Marcus Foster Education Fund. The College Access Foundation of California funds this work. The goal for East Bay CAN was to implement strategy that would increase the Free Application for Federal Student Aid (FAFSA) completion at three under- resourced Oakland High school sites: Castlemont Community of Small Schools, Fremont Federation and McClymonds. During the 2011-2012 academic year, the ultimate goal of the collaborative was to increase FAFSA completions by 50% at the aforementioned schools. We produce a PTC2 Annual Report to provide students highlights. For additional information or to donate to the program, please contact our Pathway to College and Career Coordinator at (510) 569-8088.